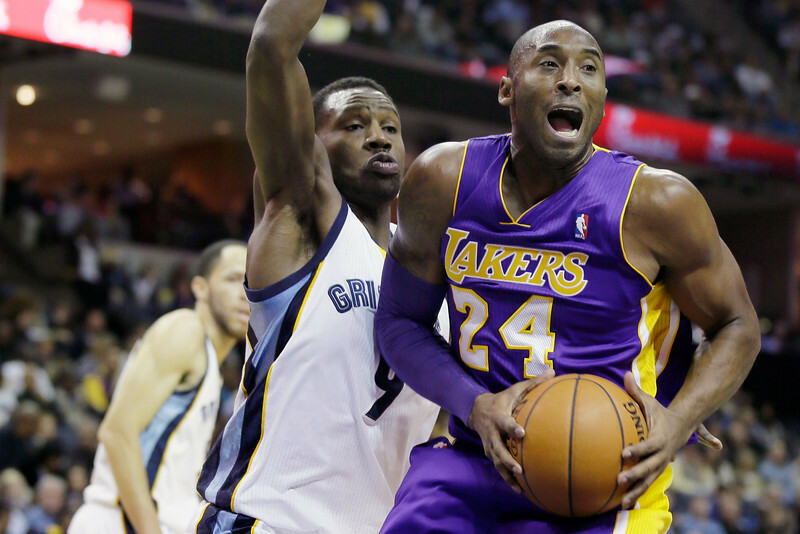 MEMPHIS, Tenn. — A gasping silence permeated Kobe Bryant, and the Lakers know all too well about that sinking feeling. They experienced that numbing sensation eight months ago when Bryant fell to the floor on a play he swore he performed a million times. But in this one instance, Bryant shattered everything. Shattered his left Achilles tendon. Shattered the Lakers’ playoff chances. Shattered the clarity on how his career would ultimately end. So it only seemed natural for the Lakers to react the same way when Bryant hyperextended his left knee after colliding with Memphis guard Tony Allen late in the third quarter. Was Bryant scared? Yet, the fear didn’t materialize into anything. Bryant walked up, stretched the knee out and talked with Lakers’ trainer Gary Vitti. Bryant then finished a performance that showed his effective determination in shedding off the rustiness that has followed him in his week playing since rehabbing his left Achilles tendon. Bryant’s team-leading 21 points on 9 of 18 shooting, four assists and four turnovers in 33 minutes represented his best performance yet. He made a 28-foot three-pointer that gave the Lakers a 91-85 lead with 2:39 remaining in the game. Bryant showed more energy than he displayed the previous night in Atlanta where he had only eight points on 4 of 14 shooting, six assists and five turnovers in 32 minutes. And with Bryant absorbing another new injury, the Lakers’ star proved again he’ll overcome it. To do that, Bryant made plenty of adjustments, and it went beyond the pre-game routine of icing his body and receiving treatment. A day after reporting feeling “stiff” in his Achilles, Bryant went to the locker room midway through the first quarter to keep his ankle warm. Lakers coach Mike D’Antoni joked Bryant performed “hot yoga.” In reality, Bryant received more manual therapy to prevent the stiffness that plagued him the previous night in Atlanta. Bryant consistently looked to score in a variety of ways. Off pick-and-rolls. Off isolations in the post. Off off-ball cuts to the basket. He then capped that off with the 28-foot three-pointer. “It felt good to have one go in,” Bryant said smiling. But what if he missed that shot and cost the Lakers the game? Instead, Bryant received a few breaks to stay healthy, all that pre-game and in-game treatment assuring he would have the proper lift and accuracy that had plagued him in earlier games. Not that this should be surprising. Yes, he is. But even if Bryant has done this many times before, it’s still amazing to see his determined play unfold again and again.